Lego Minecraft was in very short supply during the later part of 2012 with inflated prices being charged in the run up to Christmas. The situation has improved slightly in the UK now with more stock being made available. Created by the founder of Mojang AB Markus Persson, Minecraft was rated the fastest growing game of 2012. Inspired by Dungeon Keeper, Infiniminer and Dwarf Fortress the game involves players creating and destroying various types of blocks in an online 3D environment. 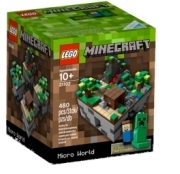 Due to it's massive appeal the game has been transferred to LEGO in microbuild form which allows you to build your very own Minecraft Microworld which includes the 2 Micromob characters Player and Creeper. We constantly check for Lego Minecraft stock, so you don't have to. Receive email alerts when Lego Minecraft online stock is found.